Trump Agrees To Meet With Kim Jong Un: "Great Progress Being Made"
"Kim Jong Un talked about denuclearization with the South Korean Representatives, not just a freeze. Also, no missile testing by North Korea during this period of time. " "Great progress being made but sanctions will remain until an agreement is reached. Meeting being planned!" Oh to be a fly on the wall at that meeting! As we detailed earlier, while speaking to reporters at the White House, South Korean envoy Chung Eui-Yong said, and the White House confirmed, that Trump has accepted to meet Kim Jong Un, by some time in May, in what would be a historic first: no sitting American president has ever met a North Korean leader. Chung Eui-yong made the announcement during a news conference outside the White House after meeting with Trump administration officials. Chung said the North Korean leader has expressed his "eagerness to meet with President Trump as soon as possible." Chung had led a South Korean delegation earlier in the week on a historic trip to Pyongyang. During the trip, the envoys became the first South Korean officials to meet with Kim since he took power in 2011. Earlier this week, the South Korean envoys announced that Kim told them he is willing to begin negotiations with the United States on abandoning nuclear weapons and that he would suspend all nuclear and missile tests while engaged in talks. Chung also told Trump that Kim Jong Un "said he's committed to denuclearization." While the Trump administration greeted the offer cautiously, expressing both hope that talks can happen and skepticism at Kim’s sincerity, Trump "appreciated the briefing and said he would meet Kim Jong Un by May to achieve permanent denuclearization." Trump's eagerness to meet is at odds with what SecState Rex Tillerson said earlier today on North Korea: "We're a long way from negotiations. We just need to be very clear-eyed and realistic about it." Chung added that he "explained to POTUS that his leadership and his maximum pressure policy together with international solidarity brought us to this juncture." As reported earlier, Trump had touted the announcement Thursday night to reporters at the White House before it was delivered by the South Korean official, characterizing it as "major." "It's almost beyond that," Trump told ABC News's Jonathan Karl when asked if the announcement was about negotiations. "Hopefully, you will give me credit." In typical reality show style, President Trump managed to build up a wall of suspense ahead of tonight's South Korean delegation announcement at 7pm. 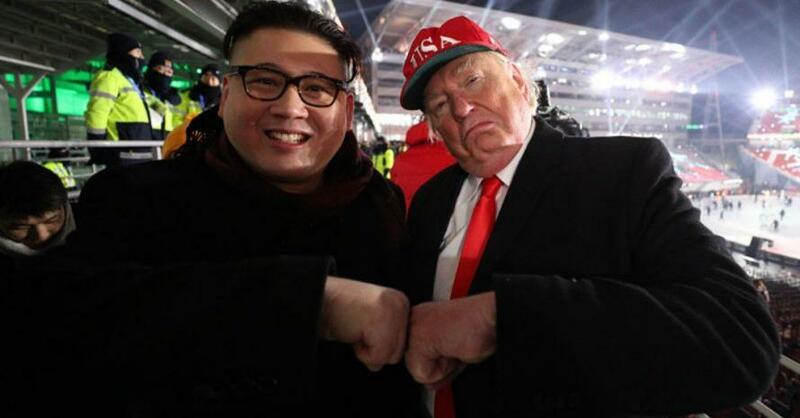 However, it appears that much of this excitement may be for nothing: according to CNN and Fox leaks, the announcement will be far less exciting than the "denuclearization" declaration some had expected, and instead Kim Jong Un invited Trump to meet in the message that was delivered by the South Korean delegation. Whether Trump will accept the invitation, and what conditions he may have will likely be unveiled in the next few hours. However, if the president was hoping to offset his "trade war" with a diplomatic detente with a potential "nuclear war" opponent, this may be just the right opportunity.